This week’s guest blog comes courtesy of Zoe Long. Zoe is a MA student studying Climate Change: History, Culture and Society at King’s. For those who could not attend the event, here is a summary of some of the best advice. Was your first job you dream job? The overwhelming response was no. Instead, the advice was to focus on the role and the skills it can help you to develop. Considering why the job does not suit you can help shape where you want to be next. Each panel member has a very different background and route to sustainability, however, they were united by the fact that none of them actually intend to work in the sector. Instead, each person followed a career route led by their interests and networking! How can you find jobs in smaller, harder to find companies? Recruitment consultants a good place to start; there are lots of niche recruitment firms, but Acre was mentioned specifically. Whilst they may not have specific graduate roles, a role may come up once in a while and by talking to recruiters you are putting your name out there. Escape the City was also brought up as a place to look for less traditional roles. Twitter, LinkedIn and any social media accounts are often sources of niche roles that may not be advertised elsewhere. When reading reports, check out who wrote the report and if the company is somewhere you would be interested in working. Finally, it is a cliché but networking counts! Get out there and talk to people, be interested in other people’s work and attend lots of events, London is the perfect place to do so. The panellists were very clear you should do your research to really understand what the company is about. You must demonstrate you know who you are applying to. Kat suggested saving your time applying to 100 companies in favour of spending time perfecting five or even one application that you really want. In this time it is important to show the skills you will be using in the role such as research and analysis. Demonstrate you know what the role involves, and how your skills fit the tasks involved. If you haven’t got a formal education in the role you are applying to, show your interest through practical action or evidence such as volunteering or blogging. What is the future of the sustainability industry? There are no signs the sustainability sector growth is slowing. In fact, all signs point to it growing, as larger firms dedicate more resources and time to grow their sustainability departments leading. This will lead to a skills demand in the market. But the sector is changing. Terms like ‘sustainability’ and ‘CSR’ are being used less and less as sustainability becomes a good business practice rather than a side branch of this business. As sustainability becomes integrated into businesses, jobs will be less advertised as pure sustainability roles and more about core business functions with an edge (or interest) in CSR and sustainability. This means it will be harder to find specific roles so you should focus on your interests and skills. David from Good Business mentioned that when hiring, his firm did not necessarily look for a background in sustainability but rather the skills (business or otherwise) that the candidate will bring to the firm. Secondary to this is a demonstrable interest in the company’s values. Think commercially; trends set to grow include Big Data, AI, and Block chain so start brushing up! Nevertheless, this is definitely a growing sector, becoming important in every sector and job. This year for Sustainability Week our Sustainability Champions outdid themselves, hosting events, bake sales and litter picks, showing that no effort is too small to make a difference. This week’s guest blog comes courtesy of Ioannis Golsouzidis. Ioannis is a Graduate Analyst for IT. Since forming the team, we have had our CIO sign our pledge, sent out communications to staff to power off non-essential equipment over Christmas, implemented waste paper trays in printing rooms around our department, changed some of our suppliers to more sustainable alternatives and, of course, planned some stuff for Sustainability Week amongst other things! InstaVeggie: All staff were encouraged to try eating a vegetarian/vegan lunch at least once during the week of 12th-16th February and send a picture of the dishes that had inspired them to do so. All participants got a small prize. Iron Veggie Challenge: Staff were challenged eat a vegetarian/vegan lunch for all 5 days and there were special prizes for those who sent in pictures. Sustainability Lunch: We organised a lunch at Sagar Covent Garden (a vegetarian restaurant) on the 15th February 2018 as a get together for staff across the department. Sustainability Pop up: This year for Sustainability Week we hosted an interactive stall across King’s campuses. 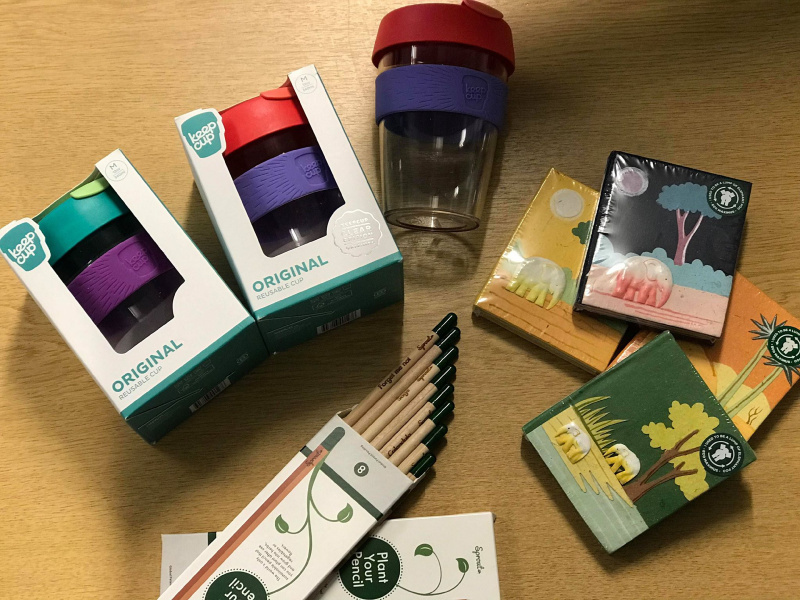 We gave you the chance to win a Keep Cup by correctly guessing how long it took everyday items to degrade (many people were shocked to find out that it can take a plastic bottle up to 450 years to degrade! ), quizzed you about how to correctly recycle at King’s and played a game to see if staff and students know how to use or special coffee cup bins (remember, #fliptipslip!). VegFest: Studies show that a veganism can reduce the environmental impact that your diet has, and reducing the amount of milk and dairy we consume can positively affect climate change. In collaboration with EcoSoc we hosted a VegFest with free samples of vegan cheese (thanks to Bute Island Food who were also kind enough to donate last year). Students and staff brought delicious dishes for everyone to try, talked about the environmental impact of the food we eat and discussed the issues surrounding veganism. Careers Events: Sustainability is more and more becoming an integral part of business and big organisations. King’s Careers and Employability hosted a successful event during Sustainability Week with guests from law firm Allen & Overy, Good Business and our Head of Sustainability Kat Thorne. The event was designed to help students understand how they can find internships and develop their career in sustainability. For more information please visit King’s Internships. Cycling: In the Sustainability Team we do everything we can to promote cycling at King’s. Because of this we held four Dr Bike sessions. These sessions provided free bike checks to students and staff throughout the week. Mechanics changed bike pads, checked chains and for whatever they couldn’t fix, gave accurate quotes for how much it should cost to get repaired. Geography Documentary Screening: The Geography Department Sustainability Champions and King’s Climate hosted a film screening of former US Vice President and environmental activist Al Gore’s latest film ‘An Inconvenient Sequel: Truth to Power’. A panel beforehand made up to PhD students, lecturers and Dr George Adamson discussed our response to climate change and the best ways to tackle the issue. GoodGym: King’s GoodGym is a community of runners that combines getting fit with doing good. For this session the runners went to Oasis Farm Waterloo, and urban farm and community resource, to help to make planters for trees. King’s GoodGym is a great way to get fit and to also to help the local community. Read more about the Sustainability Week session on our blog. Temple Gardening Club Winter Pruning: We teamed up with the Northbank BID to bring you this gardening session at Temple gardens. Staff and students braved the cold weather to prune rose bushes ready for regrowth in the spring. SGDP Sustainable Labs Tour: Labs consume 3-10 times more energy per square metre than normal academic spaces like lecture theatres or offices. As a research university, King’s manages a variety of energy-intensive labs across its campuses, which is why it’s so important to make our labs as sustainable as possible. This tour of the laboratory at the Social, Genetic & Developmental Psychiatry Centre was led by Bernard Freeman, Lab Sustainability Champion. The SGDP lab has achieved a Gold Award at the 2017 King’s Sustainability Awards, and Bernard was a Finalist in the 2017 Green Gown Awards for his efforts in embedding sustainability into labs. This year Sustainability Week was all about how you can make a difference, which you showed us you can do in so many ways! From volunteering, bringing in homemade vegan food to finding out how you can develop your career in sustainability, you showed us exactly what the King’s Community is capable of! Fairtrade Fortnight puts a spotlight on trade, and the benefits fair and ethical trade has on the lives of farmers and workers who grow our food. It takes place from the 26th February to the 11th March 2018, with a variety of events happening around the UK – including at King’s. The King’s Sustainability Team is excited to welcome Ketra Kyosiimire from the Ankole Coffee Producer’s Cooperative Union Ltd (ACPCU) in Uganda to King’s for this Fairtrade Fortnight event. 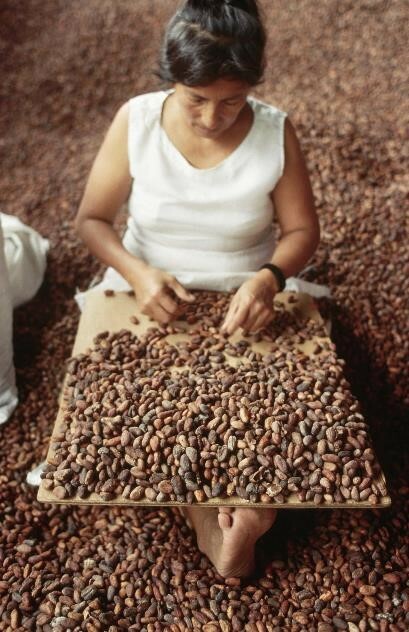 Ketra is ACPCU’s accountant, giving her an oversight of all coffee production and sales, Fairtrade contracts and investment of the Fairtrade Premium in business improvements and community development. She’s also a farmer herself, and will speak about her experience of international trade and the difference Fairtrade can make from the producer’s perspective. ACPCU is an organisation supporting 17 Fairtrade certified cooperatives across southwest Uganda. There is a mixture of subsistence and commercial farmers in these multi-ethnic communities. Agriculture is the main source of income, and with assistance from Cafedirect, they have organised into a strong Union. They have created job opportunities, involved women and youth in their activities, and developed skills and long-term peace in their communities. ACPCU members now manage their coffee from farm to export; by avoiding intermediaries, members can maximise their incomes. 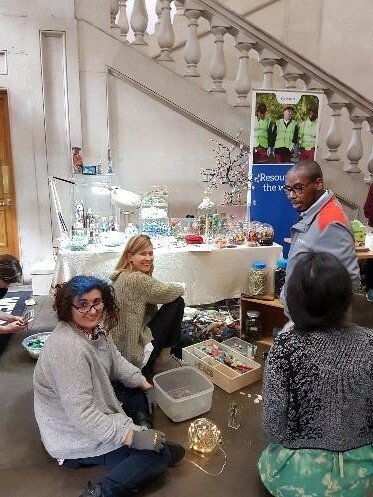 Thank you so much to everyone who helped us to put on events, chatted to us during our pop ups and helped us to spread the sustainability message throughout King’s. The success of Sustainability Week 2018 wouldn’t have been possible without you all and we in the Sustainability Team are grateful to everyone who participated. We will be bringing you blog posts about all of the different events from the week, and to start of we have a recap of the King’s GoodGym run to the Oasis Waterloo Farm. The following guest blog comes courtesy of Alyx Murray-Jackman. Alyx is a Sport Participation Coordinator for King’s Sports. Tonight we visited Oasis Farm Waterloo, an urban farm and community resource in Waterloo, a hidden gem just moments from the Southbank, and the closest farm to Parliament. We also managed to run 4km and fit in a quick but tough circuits session. Joining us for their first ever GoodGym group run, we had the amazing Rajmund, Anna, Georgia, Octavia and Theo (wow so many!) – give them a cheer for coming out in the cold and using their run to do some good. As well as welcoming these fab runners we also heard about the Long Run taking place in South London this weekend for anyone that’s about, and a little reminder of the Thursday running fitness session happening in Vauxhall this week. As well as braving the cold, here at GoodGym King’s we also had to brave the busy Waterloo Bridge Commute as we couldn’t head out over Blackfriars Bridge as usual due to the location of the task. We practiced our dodge, duck, dip, dive and dodge techniques and headed out. With everyone safely over the bridge, we made quick work of the rest of the journey down to the farm and met Roddy outside. The task: The super organised Roddy split us up into groups when we arrived and showed us each to a planter – we needed to remove all the soil, take out all the bricks, move the planter, and then re-fill it with the bricks and soil – we had a tough 40 minutes ahead of us with a good arm workout! Between us we managed to fully move a couple of planters and make a great start on 2 or 3 more which some volunteers are going to finish off in the morning. I think the sounds of the animals settling down for sleep helped us work hard (especially the pigs from the Pig Palace!). Roddy kindly let us use the farm’s new barn for our fitness session as it started to rain. We went through questions like “are you scared of spiders?”, “have you eaten any pancakes already today?” and “do you cycle to work?” – if you answered yes to the question you had a 40 second strength exercise to do, if you answered no then it was a 40 second cardio exercise. After lots of squats, high knees and mountain climbers (great suggestion Sophie! ), we were ready to head back to King’s. We waved goodbye to Roddy with promises of coming back soon to help with more tasks (hopefully in slightly warmer weather)! We ran back a slightly longer route, with slightly better views, over Westminster Bridge and did some stretches back at the base. Credit to Gosia for the pun! February 13, 2018 / Sophia Courtney / Comments Off on It’s Sustainability Week! Welcome to Sustainability Week! Make sure you check out our full timetable here. It’s gotten off to a great success so far. Our vegan lunch on Monday gave staff and students the chance to learn more about a plant based diet, as well as try some free samples of sheese and vegan chocolate. We’ve had careers advice from expert in their fields, including our Head of Sustainability, Kat Thorne, about the best way to develop your career path in sustainability. Still to come we have a panel discussion and film screening of the Inconvenient Sequel with the King’s Geography department. There will be free bike maintenance sessions across campuses for cyclists, as well as a King’s Move challenge running throughout the week. Sustainability Week also aims to show that no action is too small to make a difference, with a talk on how to live ‘zero waste’ and opportunities to volunteer in local community gardens and pond conservation projects. We will also be holding pop-up stalls at all campuses to give everyone the chance to find out what King’s is doing to be more sustainable, and win prizes by playing sustainability games. All Sustainability Week events are free to attend, though some require booking. For more information, please visit kcl.ac.uk/sustainability, follow @KCLSustainable on Twitter, or like King’s Sustainability on Facebook. Join us for the launch of Re-energise and the film screening of An Inconvenient Sequel Truth to Power. The Re-energise campaign aims to reduce energy use and save carbon at New Hunt’s House and Franklin-Wilkins Building, at the Guy’s and Waterloo campuses. The launch event is taking place at New Hunt’s House on the 26th January. A range of energy saving measures have been completed, with more to follow, that will reduce carbon emissions and energy costs in New Hunt’s House and Franklin-Wilkins Building. These include the installation of LED lighting and behind the scenes measures such as the optimising controls for heating and air conditioning. However, Re-energise also needs the support of students, staff and other building users to meet the ambitious targets for energy reduction and build on the great work done by the King’s Sustainability Champions. Print off or email round our our Re-energise Launch Poster to advertise to staff and students! Information about the campaign can be found at internal.kcl.ac.uk/re-energise. A decade after An Inconvenient Truth brought the climate crisis into the heart of popular culture, comes the riveting and rousing follow-up that shows just how close we are to a real energy revolution. Former Vice President Al Gore continues his tireless fight, traveling around the world training an army of climate champions and influencing international climate policy. Cameras follow him behind the scenes — in moments both private and public, funny and poignant — as he pursues the inspirational idea that while the stakes have never been higher, the perils of climate change can be overcome with human ingenuity and passion. Today is the first day of the Totally Thames Festival, which means Maria Arceo’s artwork “Future Dust” is now open to the public! Over the last year, King’s artist in residence Maria Arceo has collected plastic from the banks of the Thames. The project was supported by the King’s departments of Geography, Chemistry as well as the Cultural Institute. Maria is passionate about archaeology and oceanography, and interested in the footprints humanity leaves on aquatic environments. Plastic is one of these modern footprints, with countless reports on the amount of plastic debris that ends up in the planet’s oceans. As campaigns such as ZSL’s #OneLess, and Hubbub’s For Fish’s Sake London highlight, London is a city closely linked to the sea. Waste in the tidal Thames will eventually end up in the oceans, and after breaking down into microplastics plastic might end up back on our plates. With her Thames Plastic project, Maria wants to show Londoners the real magnitude of plastic debris entering the Thames. Since September 2016, she has done over 40 beach clean-ups all over London. Some King’s students and staff joined her for a clean-up during Sustainability Week, and picked up a complete computer keyboard in the mud between Millennium Bridge and Southwark Bridge. 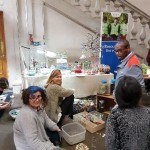 After the beach clean-ups, the workshops to clean and sort the plastic in May and June provided a perfect opportunity to look at the curiosities Maria and her team of volunteers found in the Thames (some photos of her Somerset House workshop can be found here). Now complete, the “Future Dust” installation is a giant human footprint, entirely made from plastic from the Thames. Starting today, the piece will travel along the Thames for the rest of the month. It is currently near Guy’s Campus, in Potters Field Park outside City Hall, SE1 2AA. Next, it will move closer to Strand and Waterloo campuses – it will be the Oxo Tower Courtyard (SE1 9PH) from Sunday the 3rd to Wednesday the 6th September. Details of all locations can be found on the poster below, or on the Thames Plastic website. On the 3rd July, the annual King’s Sustainability Awards took place at Strand Campus. Professor Ed Byrne, President & Principal of King’s College London, opened the awards by highlighting how important sustainability at all levels is to King’s. “Thank you Kat Thorne, Tytus, the team, and thank you to all of you who have been involved in this amazingly important work over the last year. You will all have seen Vision 2029, hopefully more than once by now, and […] empathise with the tagline of 2029, ‘To make the world a better place’. And of course, there is no more important way to do that than around the incredibly important agenda of sustainability […], arguably the most important single area the human race needs to do better in. So, thank you to you all. To our students, to our Champions, and many of you are in the audience. To those supporting them, and to those for whom it is part of their job role: our cleaners, our security, our engineering staff. We are here to celebrate a year of achievement by everyone, and this is an area where individual actions tell the whole story. Individual actions by a large community such as ours add up to make a real difference. So, what does sustainability mean to King’s, what does it mean to me? It’s so important that everyone in the university buys into this agenda. It’s at all levels – if one believes in levels at a university. It’s bottom-up, it’s top-down, it’s in departments, it’s in professional staff, it’s in academic staff, it’s in our student body; we all have to show commitment in this area. Sustainability is one of the core foundations of Vision 2029, and is integrated throughout this vision, it comes up time and time again. We have a duty, a responsibility, to support and deliver, in a number of domains, against the 17 UN Sustainable Development Goals. This applies to our research, our education, and to how we run our business, our university operations, I know many of you in this audience who are involved in this area. As we know, this is important for people of all ages, but it is particularly important to our students. And I think it’s not just because they are young people and are likely to be around for longer and see what happens to the planet over the next 50 years. But it’s because young people have a passion to preserve the environment. We all do, but there’s no doubt it’s developed deeply and strongly in our youth, in this country and around the world. 89% of King’s students, in a recent survey, stated that sustainable development is something universities should actively incorporate in their missions and promote. Our students, in their activities and running societies, in acting as volunteers in so many different areas, in working with the local communities, make a difference around the sustainability agenda. This is incredibly important to our students’ careers and employability, the opportunity to have careers in sustainability, the opportunity to take part in events which are supported by our alumni who are sharing their experiences with our students. So I want to thank our students and our graduates who have worked with the team over the past year, and good fortune to them in the future. Let’s acknowledge them now [applause]. We have to get better at this all the time, there is no room for complacency. But I think we are working to constantly improve the way in which we make sure our students leave this university with the skills and knowledge necessary to be agents of change, and to be able to make a difference in promoting a sustainable world. Let me turn to research a little more. There are umpteen examples of colleagues working around King’s to address global grand challenges under sustainability theme. I could mention dozens of examples, but I’m just going to mention two or three. The Global Consortium for Sustainable Outcomes (GCSO), where in one project we are carrying out a living lab project in our own buildings to reduce the carbon footprint and the use of hot water – something simple, but complex. And I must mention the PLuS Alliance, because it has been a sort of baby of mine to get this under way. Combining the strengths of three leading research universities on three continents, all with significant activities around the sustainability agenda – Arizona State University (ASU) in Phoenix, King’s in London, and University of New South Wales in Sydney, Australia – and focusing many of our colleagues in those universities to work together around the global grand challenges in health, social justice, sustainability, technology and innovation. This is hugely important. We’ve seen great momentum since the launch of PluS last year, we’ve appointed over 100 PLuS fellows working across the three institutions, and the sustainability agenda is the dominant agenda to date – we have 11 research projects with seed funding. Now, let me move on to another of the key domains which I alluded to briefly: our operations as an institution, because we have to live the dream, we have to do our bit and be an example to others. Sustainability Champions have a crucial role to play in reducing the negative impact of our operations. The Champions know their area best, they can identify positive actions and work with their colleagues to make a real difference in their area. And we have this in spades. Much of the work we’re going to hear a little bit about is focused on reducing the environmental impact of our research in labs, while also improving the research environment. A laboratory consumes up to 5 times more energy than a typical academic space, therefore actions of Lab Sustainability Champions can have a big impact. We were highly commended at last year’s Green Gown Awards, a major award, for our Sustainability Lab programme. And it’s really great to have worked closely with a university I was a little connected with, UCL, and to have Champions working across King’s and UCL, auditing each other and sharing good practice across these institutions. I am also delighted to announce that this year our colleagues across Estates & Facilities and the sports grounds have been externally audited, and last month they were accredited in a major programme: the ISO14001 programme, an internationally recognised standard for environmental management. Can you join me in saying well done to everybody who played a role in that achievement [applause]. This year, we’ve had some incredibly engaged colleagues right across the university, truly making a difference in their workplaces. We look forward to celebrating with them shortly, as we celebrate their awards. Finally, for the next year, this has been an increasingly powerful story at King’s over the last three years. I have no doubt that the coming year will be no different. I am sure that we will perform against our agreed objectives in our Sustainability Charter. One thing I intend to do is report regularly to Council about that now, because we have some momentum around that and I think it has reached that stage. I was reading a university I worked at for many years in Australia, the University of Melbourne, is recycling their office equipment, and they have made and saved a bit of money in this highly sustainable agenda. I was delighted to see on our notice boards that we have saved £40,000 just by recycling office furniture at King’s, which is a phenomenal achievement and exactly the sort of initiative we need to continue. In my own contribution over the next year, I am going to ensure that as we launch the new King’s Business School as the next Faculty at King’s, sustainable development and educating business people for the future in triple line reporting and in sustainable development will be a key theme of our school, that I want it to become renowned for throughout the world. That again will be a big step forward for King’s. 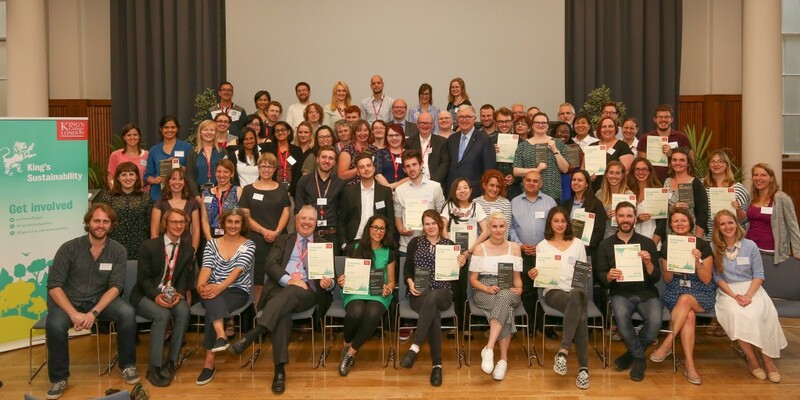 The annual King’s College London Sustainability Awards took place on Monday the 3rd July. The Awards highlighted the growing commitment and enthusiasm of the King’s community for sustainable development, one of the enabling foundations of Vision 2029. During the ceremony, 45 teams comprising of over 200 Sustainability Champions were acknowledged for all their hard work in introducing sustainable practices into their workspaces over the course of the academic year. The ceremony also celebrated the efforts of staff and students who have made significant contributions to sustainable development across our operations, teaching, research and the wider King’s community. Professor Edward Byrne, President & Principal of King’s College London, opened the Awards by highlighting the importance of sustainability and the work of the Sustainability Champions. He also announced that King’s recently achieved the ISO14001:2015 certification for the Estates operations on all campuses, including residences and sportsgrounds. You can find out more about the certification in the Estates & Facilities news. Kat Thorne, Head of Sustainability, then reviewed the progress King’s has made in sustainability over the last year. Over 200 Sustainability Champions have carried out over 1,500 sustainability actions, resulting in 45 teams receiving Sustainability Awards. At an operational level, the university has reduced its carbon emissions by 26% since 2005/06, despite significant growth during this time period. The furniture re-use project Warp-It has now saved over £50,000 in procurement costs. In relation to sustainable food, the university is now a member of the Sustainable Restaurant Association, and has applied for Fairtrade University status. The 45 Champions teams were then awarded Bronze, Silver and Gold Awards. This year, 18 teams achieved Bronze, 19 teams achieved Silver, and 8 teams were awarded Gold. In addition to this, we celebrated individual Champions, staff and teams who went above and beyond in their roles to embed sustainability into King’s. All photos are now available here. Thank you to all of those who have played a part in the Sustainability Awards this year, including our over 200 Champions!